Packing up a house for an interstate move is not pretty! (Not showing any photos of that mess!) But I received something from my beloved Garden Club yesterday. 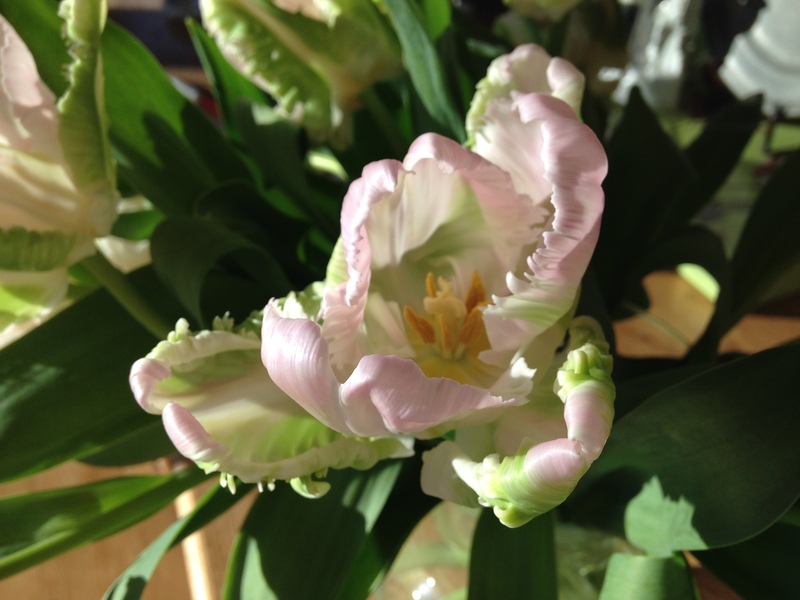 The touching words and “good bye” was accompanied by the most glorious bouquet of tulips…. something pretty to look at while I pack! I will appreciate their prettiness while I tackle the ugly mess of cardboard and tape, and I will be reminded of the 25 years of friendships I have developed with this indomitable and irreplaceable group of gardeners. This entry was posted in Uncategorized and tagged garden club, good bye, tulips. Bookmark the permalink. What a lovely thought, but then I always knew that gardeners were nice people! Hope your move goes well. Good luck with your move. Ruffled tulips would certainly warm my heart. It would be challenging to leave friends with such a rich history. Gorgeous photograph! I have to comment as we completed our move yesterday.. and I’m so tired. We are starting a building project and have lots ahead. best to you as you blossom in your new garden! (i almost said ‘digs’ ). moving is a stressful time but an opportunity for growth, right!?! the most beautiful tulips ever! I am so very sad and will treasure the begonias but am happy for you and your new gardening life. Hi Jayne, I wish you a smooth and speedy move. The packing for our very recent relocation is still a fresh memory and I don’t envy you the job. Hope all goes well.